Building on our previous courses relating to Islamic Education and teaching, we are please to announce the PGCE (CERTIFICATE) IN ISLAMIC EDUCATION – Developing critical and transformative learning & teaching models in contemporary Muslim educational practice taught by Dr Abdullah Sahin [The Research Centre for Muslim Educational Thought & Practice]*. This has jointly been organized with the Ebrahim College . Award: PG Certificate upon successful completion of the course work. Those who wish to continue for the MEd in Islamic Education will be fast tracked. Aimed at: PhD students, Islamic schools and weekend and maktab teachers, seminary teachers (Dar-Uloom) and graduates, students of knowledge (tulub al ilm) from various institutions of the Muslim world. Non Muslims working in a RE framework are also welcome ! In almost every profession, there is continuous professional development with exception to those teaching Islamic Education. The key sources of Muslim tradition – Quran and Sunnah – both articulate a Prophetic ‘critical, dialogical and transformative education vision’ which should guide ‘contemporary Muslim educational practice’ (Sahin,p30). Whilst there is much benefit in rote learning, the perception of Islamic education displayed within the traditional forms of Islamic institutes across the Muslim world.. indicate features of an instruction-centred and rigid inculcation process that largely ignores the personal agency of the learner. So reducing the experience to a process of mere training, instruction, and, often if not always, indoctrination, largely due to the neglect of critical reflection upon the meaning of education. Such practices fail to transform the learners and communities to develop the courage and competence required to face the challenges of today. Muslims do not exhibit mature faith development; often, religion appears to function as a rigid structure that blocks the natural growth in their personality [Sahin: p3, 167,238-9]. The ‘Certificate and MEd in Islamic Education’ is a culmination of years empirical and proven experience, where Dr Sahin devised a means by which attitudes towards Islam and the religious subjectivity of research participants could be measured. This may help to construct ‘Islamic pedagogic models’ to be practiced within diverse contemporary Muslim educational settings. The Certificate is a unique 3 months intensive, covering the core modules of the MEd for those with limited time but wished to be recognized and those who wish to continue for the MEd in Islamic Education will be fast tracked. The overall outcome would be an improved delivery of services, standards and experiences. 2) A selected number of contemporary educational approaches and pedagogic models that are central in understanding and analysing the nature of educational process. Students will be first critically engaging with key aspects of the educational process and explore in depth three major pedagogic models i.e. Critical Thinking Active learning, Self-Organised Learning and Reflective-Experiential Learning and Teaching Strategies. Following this, students through structured sessions on classical foundations of Muslim educational heritage will develop a deeper understanding of the fundamentals of Islamic Education and critically discuss how to construct Islamic pedagogic models to be practiced within diverse contemporary Muslim educational settings. 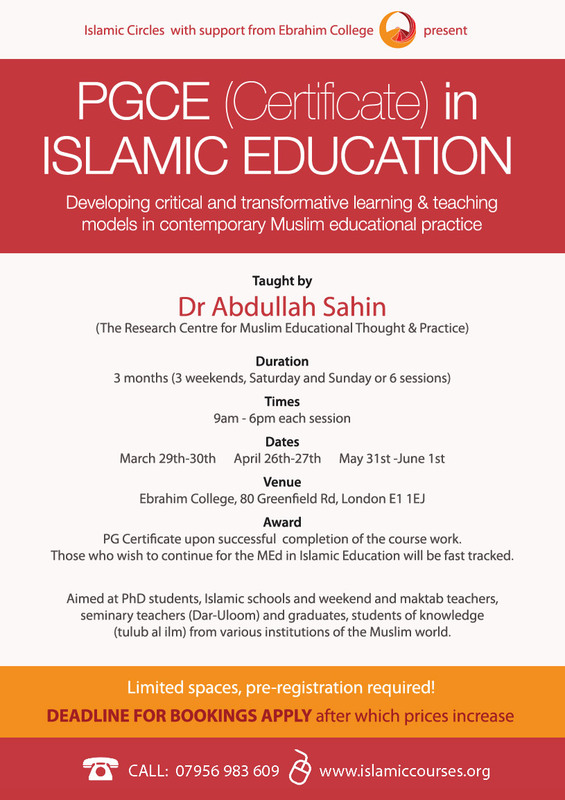 The central aim of the course is to enable participants to develop competence to think educationally about Islam and apply new insights from relevant modern educational theory and practice to Islamic Educational practice. Students will receive three sets of study materials containing all relevant essential and recommended reading materials. The course assessment will consist of a short review assignment, a long as essay and a class presentation. Full details of the assessment will be provided separately. Successful completion of the course work will lead students to achieve 60 CAT (credited) points. Q. Why we have called it a “PGCE (Post Graduate Certificate In Education) in Islamic Education” A PGCE course mainly focuses on developing your teaching skills, and not on the subject you intend to teach. For this reason, you are expected to have a good understanding of your chosen subject(s) – usually to degree level or equivalent, if – before you start training teaching. The course is organised as a professional development course and intended to operate at the postgraduate level. As such PG Certificate usually is the first stage of a postgraduate provision that is followed by PG Diploma and PG Degree ( i.e a full MA or MEd course). The current course is pitched at certificate level (60 CAT credit points equivalent) and those who will be successfully completing the course will be fast tracked to the MEd in Islamic education degree course only, that is validated and run at MIHE [Markfield Institute of Higher Education], which is an Associate College of the University of Gloucestershire. 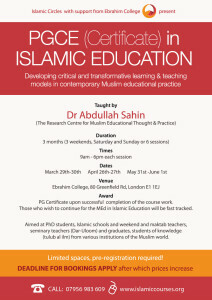 This is a Certificate level professional development course on Islamic education and aims to help Muslim educators to improve their practice and develop professional standards for the practice of Islamic Education. Please bear in mind that the course is a postgraduate level certificate course on Islamic education and at this stage it doesn’t have the practical training ( i.e. school placements etc. ) part, thus it does not licence students to teach the subject. However, the course content has both teaching/pedagogy specific units as well as subject specific ( Islamic Education) units. There are now plans to include the third, i.e. the actual school placement unit, in the course structure in the future. The aim is to contribute to the wider efforts aiming to develop a competent contemporary Muslim teacher training programme that sets the educational and pedagogic standards for the practice of Islamic education. The sessions are organized to enable students to increase their knowledge and understanding of Islam, its educational and intellectual traditions as well as to critically compare and integrate Islamic education with the wider mainstream pedagogic models of teaching and learning. The course aims to offer recognized professional and disciplinary standards in so far a largely unregulated sector of teaching that takes palace in diverse Muslim educational settings such as Maktabs, Madrassa, Islamic schools and Dar al Uluums. It is true that PG (level 7 courses) require completion of a proper undergraduate degree on the subject and Islamic Education is not yet a properly recognized undergraduate subject. However students who have completed BA in related areas such as Islamic Theology or Religious Studies in general as well as those who have completed Dar al Uuluum and have the relevant teaching experience will be qualified to take the course. Q. Who is awarding the certificate? The certificate will come from Center for Muslim Educational Thought and Practice [CMETP] but at this stage it cannot be used as a teacher training certificate. However, if students successfully complete the course then they will have the option of gaining the full validated MEd in Islamic education degree at the Markfied Institute. Q. Is it accredited? The current short course is not accredited. However those who complete it successfully will have the opportunity of using this Certificate to complete the MEd degree at MIHE which has the university validation. As such this certificate will offer a 60 credited equivalent of exemption when applying for the MEd degree in Islamic education, only! Q. Is it a licence to teach? It should be stressed that at the this stage this course is not offered within the framework of a ‘licence to teach Islamic Education’ format. Q. What are you future plans? If the course recruits well then with the cooperation of a validating body as well as with the inclusion of a school placement format it could easily be build into a practical teacher training course. This is planed as the next development strategy for this short programme inshaAllah. Q. Is Dr Sahin qualified or familiar with teacher training courses? Please read his full bio at: www.mihe.org.uk/abdullah-sahin The course tutor, Dr Sahin, has a PGCE, worked within the School Education context and is familiar with the teacher training courses. Q. Will my Islamic School / Weekend School / Dar Uloom / Institute recognize it as a qualification in “Islamic Education”? Yes and no, depending on their outlook, mentality and sincerity in Islamic Education.